By tradition the Leicester Secular Society dates its formation to 1851, although an earlier “Rational Society” branch is mentioned in No.9 of The Movement edited by G. J. Holyoake dated February 10th 1844. 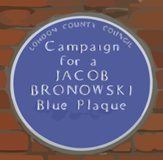 A small group of activists probably met regularly but formal meetings, advertised in The Reasoner and The National reformer in 1853, 1861, 1862 and 1867, appeared irregularly. In 1861 it had 22 members with W. H. Holyoak (1818-1907), the local radical bookseller, as organiser. From 1867 there is no break in the continuity of the records. Meetings were then held in the Russell Tavern, Colton Street. By May 1869, the Leicester Secular Institute and Club was established at 43 Humberstone Gate, described by F. J. Gould, as ‘a modest lodging’. Later it moved to 77 Humberstone Gate, a house which stood on the front line of the site of the present hall. Sunday meetings were held in a large room over some stables at the rear. For larger meetings the Society hired rooms at the Temperance Hall. The refusal of a public room to G. J. Holyoake for a lecture at the “Three Crowns” was the stimulus for members to plan the building of their own hall. Most of the finance for the Hall came from two local Owenite industrialists, Josiah Gimson and Michael Wright. The Secular Hall was opened on 6th March 1881. The anniversary is still marked by a special lecture each year. Wright died six months after the opening of the Hall and Gimson in 1883, after which their sons ran the Society. Apart from one year, Sydney Gimson was President of the Society from 1889 until shortly before his death in 1938. Joseph McCabe was appointed organising officer for the Society in 1898 but lasted only one year. He was succeeded by F. J. Gould who remained until 1908. During the 1870s and ’80s, there was controversy concerning the Sunday opening of places of entertainment, museums, and so on. When the Secular Society tried to put on Sunday concerts it at first came up against the law, but perseverance finally won a licence. On Sundays, too, the Secularists played cricket in defiance of local Sabbatarian opinion, which led to some physical conflict. In addition to cricket, the Society provided a reading room, a skittle alley, a sick club, a Benevolent Fund, a dramatic society and a swimming club among other activities. In January 1884 a series of lectures on various brands of the new politics of Socialism were arranged, the first on the 16th by H. M. Hyndman on “Constructive Socialism” then on the 23rd one by William Morris on “Art and Socialism”, and on the 28th a lecture in opposition by the Rev. J. Page Hopps of the Unitarian Great Meeting on “Sensible Socialism”. It was Morris who made the greatest impact. He also met the young Ernest Gimson who soon became a follower of his Arts and Crafts movement. When Charles Bradlaugh came to speak in 1885 the Hall, which seated 600 was not large enough so the Society hired the Floral Hall and attracted 3000. G. J. Holyoake wrote that “What may be called the Leicester principle of controversy is to question and try all assertions.” Gillian Hawtin who wrote a brief History of the Society in 1972 could confirm that this was still true then. A hymn book specially designed for the use of the Society was compiled in 1882, and a new selection “Hymns of Modern Thought” was issued in 1899, edited by Miss E. J. Troup. However the practice of singing hymns before meetings seems to have ceased by the time of the first world war. The Hall is still regular venue for musical performances, including the Red Leicester Choir and Grass Roots Ceilidh Band. 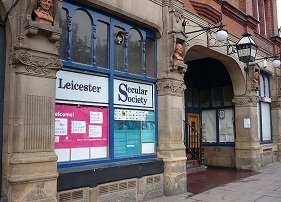 On 26 June 2007 Leicester Secular Society became a Company Limited by Guarantee, Reg.No.06292639, with its registered office at Secular Hall.